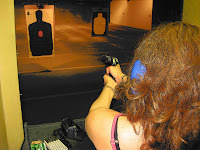 Last weekend I took the time to practice my shooting abilities. For this situation you need to have the best instructor. Firearms are not about killing for the fun of it, or for showing off, these are very important tools that deserve respect and more than that knowledge of use and safety for you and others. Well, I had the best instructor. 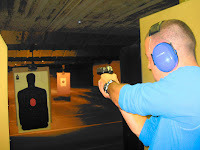 With a lot of professionalism he went through the firearm, the pieces, the use and the safety measures, all over again. Then when I was able to prove to him that I got everything, I had to also prove that I knew how to get it ready and finally shot. 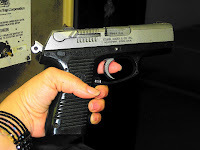 I had to shoot one time to feel the power, and then put it down using all safety measurements of discharging the arm. I had to do this five times; it was part of my training. Then the moment that I was waiting for arrived, shooting five shots in a row. We put some color to the training by calling the shots; head, chest, shoulder, arm and “low blow”-this specific shot came natural for me. But I have to admit, I’m nothing like a pro (OB). I did it. I was able to accomplish the goals and I pass my training with high standards. I felt the power in my hands, the sound in my chest, and lucky me I covered my ears. I would like to take this opportunity to thank my instructor OB.